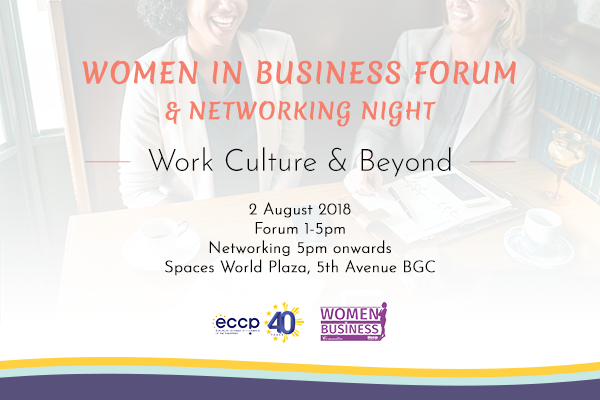 The Women in Business Forum 2018 aims to discuss how Philippine and European companies can make gender equity and women empowerment a norm in today's work culture, ensuring inclusive growth in the business environment. The half-day forum will also highlight the challenge of bridging the gap between women business leaders and "millennials" as the next leaders of the business community. The Women in Business Forum 2018 will convene speakers from different generations to share their experiences, achievements and work culture in their respective industries. Furthermore, the forum is designed to have sharp and snappy sessions with lots of interaction, co-working, networking and peer exchange. No long presentations, but practical and hands-on activities. The ECCP Women in Business Committee offers a number of partnership opportunities for you to showcase your business. We are also happy to tailor a package to your specific needs.